There is something about coming off of a long weekend festival and heading to a campground for a little rest, relaxation and doing some laundry. The campground was nice, great roads, only 15 bucks with the Passport America discount and the laundry was only about seven sites away. Ok, it was small, two washers and two dryers. One dryer had an “Out of order: does not spin” sign on the door with the coin slots taped shut. Ok, I got that. A couple of loads won’t be bad, waiting for the one dryer. Two loads started, no sweat. First load into the dryer: coins in, heat level set for high, start buton pushed. Well, 30 minutes later the laundry is still wet. Long story short, this dryer had no trouble spining. It just didn’t provide any heat. 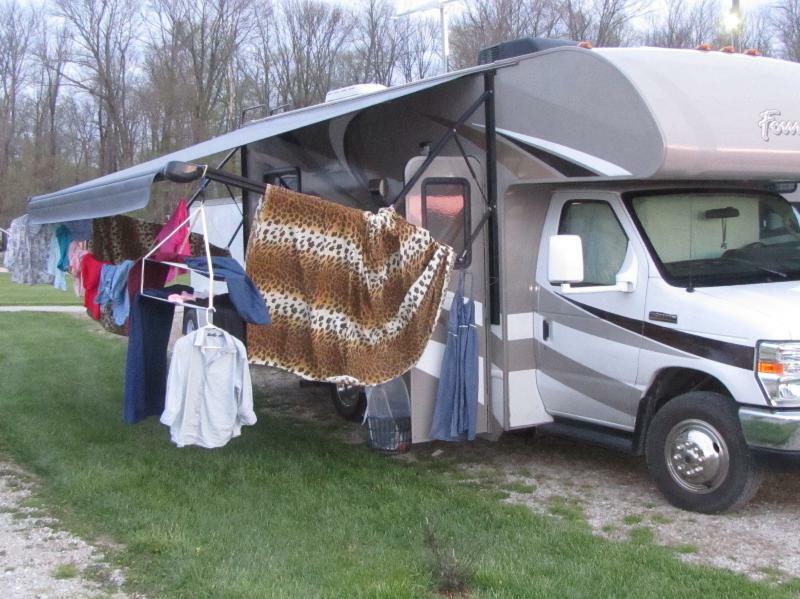 The result was turning the Four Winds 22E into a clothes line. When checking out that campground laundry, check the dryers first.